Last week I flew into LGA to meet my boss for a meeting in the city. I love going to NY with him. He knows the city instinctively, having lived there in the past. We always have dinner at a great restaurant. 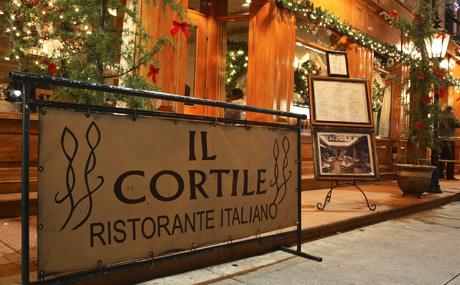 This time, we went to Il Cortile in Little Italy - 125 Mulberry at Hester. Honestly, this was our third trip there together. I'd go broke living nearby beause I'd want to eat there every day. The drinks are as good as the food, and the food is off the chart good. Old world NY Italian - the veal chop was the best I've ever had. The martinis are COLD, strong and saw a vermouth bottle once, but not recently. Go. Eat and report back.